A Sidewinder on a landing pad, the "bitten pizza slice" starting ship in E:D. CC nc-nd-by 3.0 by Nigel Hardy on flickr. An Islay Whisky is a real thing for connoisseurs. Drink one with ice and you'll get shot (or really should get). Enjoying it can lead to the most unexpecting of encounters. In this case, a personal experience of some thirty year ago turned up in the shape of Uvelius Sång, himself a newly started Elite: Dangerous Freagle pilot, but also owl fancier and Jugger. It was these 30 years ago that I enjoyed watching a friend in Berlin playing one the first and original versions of Elite on a Spectrum computer. The magic for a child of the pre-computer era to watch the first ever created three-dimensional space opera game is quite remarkable, and I enjoy remembering it even today. The load times of the tape deck were a real killer, but the game was … magic. As it turns out, Uvelius has almost the same story to tell. But he stuck to the game later on. So now, over a glass of my most appreciated, well-temperated, with carefully measured drops of water blended Laphroaig Quarter Cask, Uvelius and I got the idea to make an interview on his first steps in the nowadays Elite. So here comes CMDR Uvelius Sång, a Freagleowl. First of all: Uvelius Sång – is that a japanese reminiscence? No, not at all. Just a name from the global language of web users really. But mostly Swedish, in fact. Elite is quite a unique spaceship game. Even in the first editions down in the 80th, you had innumerable stars in different galaxies to fly to and trade with. End even then, the game was "real" 3D thanks to wireframe technology: White cages flying in front of a black screen dotted with ... dots, the cages zooming in and out, turning and shifting according to distance and maneuvers. It was simply an awesome experience, especially for a boy who did not have had access to computers. While I only watched a friend playing the original (and got shot down by some nasty triangle when I was allowed to try steering the ship myself), I later hooked up with the amiga version and got quite fond of the game. Then I lost touch until I heard of a big remake, done by nobody else than one of the two original Elite developers, David Braben. By the way, his game "Virus" for Amiga was stunning as well, sporting also an unique physics. So I watched some trailers, some work-in-progress vids – and was stunned. This not only felt like original, it also was a really, really big step forward. No bulky wannabe-coloured polygons but very nearly photorealistic models. A galaxy so huge that it was hard to believe. Everything sounded extremely promising. When the Mercenary edition came out, even offering a discount for pre-orders, I just had to buy it. It turned out to be the right decision. And did the game meet your expectations? Oh, yes! While it is of course quite an early point in time to judge, I would say it did satisfy my expectations indeed. Even after the criticism about E:D? Well, it was really annoying that Frontier did scrap the real offline mode. I don't like that at all. Not to be able to play if your network is down, or having to load some updates first before you can start is quite inacceptable. Well, not for E:D it seems. The game runs smoothly as a charm, even with a not-so highend i7 and 560 Ti GPU equipped computer. A lot of criticism roots in the misunderstanding of the game itself. Today, most games lead players like children: If an opponent is too strong for you, you will not be able to confront him, but some weak opponents are thrown at you. Or they even lay out fixed roads for players to go safely. Now Elite is absolutely different there. Choose to go against a huge starship, fine, you can do that – and your ship will most probably explode nicely. You have almost complete freedom, and that means also in error. And there is no one who takes you by the hand, explaining step by step what you should do. It is really up to you. I think that is great, because it is you who takes full responsibility for your actions -- and that is something we could only wish for in our real lives, since that is essential for a healthy democracy. This great article describes the game philosophy nicely -- and yes, in this case it is a philosophy. You call yourself a "Freagleowl". Reminds of Freaks. Are you one? Oh, too much honour would that be, I fear. No, someone mentioned that Freagle ships are those spaceships called hat buyers of the pre-order "Mercenary edition" got when the game had been launched in December. I liked the name and stuck to it. As being a Freagle pilot, you sort of become a Freagleowl when sticking to owls in general. Not so freaky after all. And I really love the Eagle as a spaceship. Uvelius' Freagle landing in a Coriolis station. CC nc-by through Uvbos flickr account. Your signature in the E:D forum states that you have played Elite before. I remember the black, star-dotted background with the small white wireframe models of starships zipping past, shooting with thin one-lined lasers. And that it had been impossible to dock at those cubic, rotating space stations. How is E:D different from that? I mean, now it is 3D with near-realistic video and sound effects all over it. An interesting question. It is impressive how much the new high-end game reminds me of the original one – the feeling is stunningly similar. The difference is not so much the graphics. You know, whether you get shot at by an outlined triangle or a sparkling arrow of doom doesn't make such a difference, as well whether you go spending credits for your ship on a black-and-white text screen or in a glowing list besides a photorealistic video of your ship. Before there had been white dots as stars, now there are colourful nebulas and stars that really exist. But in the end, what mattered for me is the feeling of the ship. The most important bit is that Braben kept the original flight dynamics: you rotate your ship instead of just drawing it to the side, adjusting your thrusters for speed accordingly. With "Flight assist off", you even have to cancel any thrust with the same amount of reverse thrust -- now that is piloting in space! Docking, for example, had been a pain in the original, before you had the routine. Docking now seems like a piece of cake, because you have lateral thrusters to align your ship to the station in peace. A new thing was the landing pad, which is quite nice to use. But then, the combats! I had been quite proficient in the old days with taking down pirates and even Thargoits. Now in E:D, I feel like a greenie. Adjusting the power flow to the different systems, using your lateral and ventral thrusters to adjust the turning curve, that all is quite very different. I am really quite a sitting duck right now, but I am fixed to change that. Thanks to my Freagle. You mentioned once that E:D reminds you of 2001 as well. How? There are some very nice reminiscences to 2001. One very cute one is the landing pad and cargo scoop animation. And almost as with the lander in 2001, when you want to land, your radar changes to a pinging target cross. Very cute. I wish there were a 8-bit color setting for your instruments, that would make it perfect. Elite: Dangerous is mostly about selling stuff and earning money. Bit on a weird side there, is it? Two dancing freagles in space. CC nc-nd-by 3.0 by Nigel Hardy on flickr. On the first glance the game does really look a bit capitalistic. You need money to equip your ship, money is the currency you get paid with for both Bounty Hunter and Pirate mission. An accountant might find huge fun in peaceful trading for days. But then, in reality, it is not all that money-focused. It is said, for example, that you might buy bigger ships in another upcoming space simulation. Not so in E:D. As the developers have confirmed, you are and should also in the future only be able to buy fancy ship skins and other not really relevant stuff with real money. Furthermore, the Freagle that I, for example got for free upon game start is said to be able to take on even quite powerful, much bigger opponents—if you know how to handle your ship. So not your money makes you so much better in Elite, but your real flying skill as a pilot player. And then, E:D doesn't charge a monthly online fee like Eve online or World of Warcraft. It is simply free, after purchasing the game itself, which is reasonably priced. So, as a summary: One might find pleasure in criticising a "capitalistic aspect" in the game. But in fact, it is much much less money-oriented in reality than many other games. No, I can't see a point there. The Freagle challenging an Imperial Clipper in a Conflict Zone. CC nc-by through Uvbos flickr account. What brought us together was also your affection for the greatest of all sports that ever has and will be played in the history of mankind: Jugger. You even state in your signature that you love it. Connections to Elite? Well, it is the love of my heart really. I think I am speaking with someone who can share that feeling, am I? That's of course the main reason. Then, it is based on a Science Fiction movie, whilst in a post-apocalyptic setting which does not fit so well to Elite. Last, the screenwriter of Blade Runner, that influenced a generation also in terms of SciFi, is also the father of that sport. So, as I said, it comes down to my affection really. Yes, a one-man show. Just for fun. But I simply like the idea of gentlemen playing that game, the pondering character of Elite also seems to attract that type. People who can embrace old enjoyments like well matured Whisky and fine pipe tobacco. Something that many ban like demons, but which is, when treated with respect, wisdom and measure, in fact a cultural treasure and a tool to sit back and think about things in peace. It is a good anchor in a sea full of idiots. In terms of E:D, I would like to think of owl order types as helpful, dedicated and resolute people. Might it be to protect each others rear in a conflict zone even when not in the same wing, or might it be by moving their cargo to the target station. Impressive planets and stars make playing Elite: Dangerous an experience. CC nc-nd-by 3.0 by h3pat1c. PS. Did I mention that all trademarks like Elite: Dangerous, Virus, Elite, World of Warcraft and so forth in this article are owned by their respective owners? No? Well, hereby I do it now, and might I add that you who is asking, sir or, indeed, madam, look to me like the typical pencil-arsed idiot. Go get a functional brain and a meaning for your sorry life. die Annahme, daß diese Anwendung zu einer Lösung oder Milderung des Problems führen könnte. "Bevor aber überhaupt irgendwelche neuen Befugnisse gefordert werden dürfen, gilt es, die Debatte vom Kopf auf die Füße zu stellen. Es muss ausgewertet werden, welche Maßnahmen überhaupt einen echten Sicherheitsgewinn bringen. [...] Wer als verantwortlicher Politiker diesen Weg nicht beschreitet, setzt sich dem Vorwurf aus, einen kalten Putsch im Sinne der Demokratiefeinde in den Geheimdiensten zu betreiben." Ankündigung: "Rassenforschung – Rassenkunde – Rassenideologie"
Rechtspopulistische Strömungen sind wieder im Aufwind. Rassismus und Vorurteile sind willkommener Brennstoff für entsprechende Ideologien und Bewegungen. Wiewohl noch vor dem Auftreten von PEGIDA und Konsorten zur Veröffentlichung vorgesehen, erscheint das Fachbuch "Rassenforschung – Rassenkunde – Rassenideologie. Die Anthropologie im Spannungsfeld von Rassenideologie und Nationalsozialismus" leider zu einem passenden Zeitpunkt. Zwar steht die Arbeit auf dem wissenschaftlichen Stand von 2000 – die zugrundeliegende Fassung stellt meine Magisterarbeit dar –, ist aber nichtsdestoweniger aktuell. 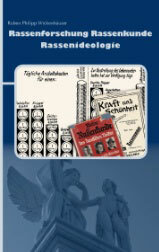 Eine Folgeausgabe mit aktuell bearbeitetem Material von damaligen Akteuren sowie zur Zeitschrift "Volk und Rasse" fasse ich derzeit ins Auge, was sicherlich auch von der Verfügbarkeit von unbearbeiteten Primärquellen abhängen wird. "Geier über Charlie Hebdo. Die Attentäter von Paris sind das Produkt westlicher Politik" ist gerade in der Tageszeitung junge Welt erschienen. Ich wünsche gute Lektüre. "Alles ist vergeben": Das ist wahre Größe. Respekt. (Daß manche Anhänger der Phantasmen über die zudem genaugenommen nur interpretierte, aber wenigstens im Bild nicht sachlich belegte Darstellung eines ihrer Lieblingsprotagonisten erzürnt sind, belegt nur ihre zynische Kleingeistigkeit). 1 3 1,5 Millionen. Großartig. Die Reihe der Staatslenker, die sich auf den beeindruckenden Fernsehaufnahmen präsentierte, war laut Independent wohl nur im weiteren Sinne tatsächlich dabei – sie bedienten sich eines Bühnentricks. Diejenigen, die wohl das Vorrecht zur Äußerung haben, legen hingegen nach: Charlie Hebdos aktuelles Titelbild. In der Türkei wird das Titelbild als "Provokation" gar mit den Morden gleichgesetzt; wobei andererseits gerade dieses Land auch Respekt für den Nachdruck von Karikaturen verdient. Keinen Respekt verdienen jene populistische Zyniker, die in Deutschland nichts besseres zu tun haben, als die Morde zum Anlaß für das Verbot von "Gotteslästerung" zu mißbrauchen; Schande über euch. Anteilnahme am Schicksal der feige ermordeten Kollegen, die den phantasmenhörigen Bestien* zum Opfer fielen. Nein, Religion ist kein Opium fürs Volk. Sie ist eine süße Droge mit schmaler Grenze zur rasereiinduzierenden Überdosis. Aber vergessen wir dabei nicht, wem wir die Destabilisierung der islamischen Welt ganz wesentlich mit zu verdanken haben: Uns, der westlichen Welt. So kommt der Terror zurück. *Vulgo: dem religiösen Wahn verfallene Menchen. Ob aktuell Allah, historisch Gott oder Götter aller sonstiger Couleur, Hirngespinste als Ausrede von Schwerstverbrechen vorzuschützen ist Volkssport der menschlichen Rasse. Es wäre lachhaft, wäre es nicht derart tragisch. Jugger leitet sich von einem Endzeit-Film ab. Läufer müssen sich auf die unterschiedlichsten Schädel, alle Spieler auf die verschiedensten Feldlinien – hier präzise mit der Markiermaschine gezogen, dort verwackelt mit Mehl oder Flatterband – jedesmal neu Einstellen: Der mangelnde Standard ist hier kein Mangel, sondern eine willkommene Herausforderung an Flexbilität und sportliches Vermögen der Spieler. Dies kann der Schlüssel zur Lesart der Regeln sein, um den einzigartigen und offenen, gleichwohl sportlich fordernden Charakter des Jugger zu erhalten. Mehr Eigenverantwortung bedingt höhere Fairness. Selten führt eine stärkere Kontrolle zu einer höheren Bereitwilligkeit, fair zu spielen, und selten führt sie zu einer besseren Stimmung – und die Stimmung ist im Jugger keine Worthülse, sondern ein wichtiges Charakteristikum dieses Sports. 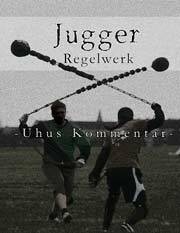 Wo anderswo Mannschaften für ein Turnierspiel zusammentreffen und danach heimfahren, ohne miteinander gesprochen zu haben, wird im Jugger nach einem Turniertag gefeiert, man sitzt zusammen und tauscht sich aus. Man lebt das Ideal des Sports an sich. Zudem ist ein Juggerspiel schwer zu überschauen (siehe 5. Die Schiedsrichter). Natürlich scheint ein Mindestmaß an Kontrolle leider unerläßlich zu sein, um den sportlichen Wettbewerb zu gewährleisten. Wir haben den Anspruch an uns, vernünftige und verständige Menschen zu sein. Wir spielen kein Zuckerpüppchenfußball, bei dem sei es der dramatischste Fall oder das lauteste Aufheulen nach einem Streicheln mit der Fußspitze am Knie einen Vorteil erjammert, sei es ein gerade wegsehender Schiedsrichter dem feigen Spieler eine Gelegenheit zur Körperverletzung verschafft. Notiz: Einsamkeit zum guten Neuen! Frohes neues Jahr! Dazu eine kleine Lektüre, die frisch erschienene Science Fiction-Kurzgeschichte "Einsamkeit" in der Wochenendbeilage der Tageszeitung junge Welt.